The annual Orange City Tulip Festival Extravaganza was held on Thursday, March 20, 2014, and revealed both the costumes for Tulip Queen and Court and the parade marshals for the 2014 celebration. 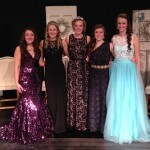 Members of the 2014 Tulip Court are Queen Ali Achterhof, daughter of Rick and Paula Achterhof; Lauren Duesenberg, daughter of Gary and Rachel Duesenberg; Emily McDonald, daughter of Todd and Kristin McDonald; Paige Nibbelink, daughter of Jamie and Kim Nibbelink; and Marissa Wiese, daughter of Rob and Tricia Wiese. 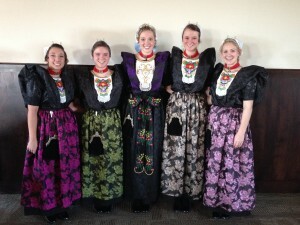 Queen Ali and her court will wear the authentic dress from Axel, a town in the province of Zeeland, for this year’s Tulip Festival. The wings, which stand up by elaborately folded craft paper, are perhaps the most eye-catching piece of the costume. Queen Ali’s wings, known as de vleugels in Dutch, are a stunning purple on floral black, and her court’s are a classic black on black brocade material. The elaborate costume also features a black brocade jacket, a black merino wool skirt, and beuks, which are made from the same fabric as the wings. The beuks, worn on the upper torso, are intricately decorated with colorful glass beads, sequin, small stones, and spangles, and were worn by the women of Axel on Sundays or for special occasions. Queen Ali and each member of her court also wear floral-patterned aprons. Queen Ali’s apron is embellished with an embroidered apron bow. The Axel dress is accessorized with a small cap that fits close to the head, gold spirals worn on the forehead, a multi-strand necklace of red coral beads, and an antique-version purse. An additional highlight to the Extravaganza was the announcement of this year’s parade marshals. The Tulip Festival Steering Committee was pleased to honor Terry and Rachel Meekma as parade marshals for the 2014 Tulip Festival. 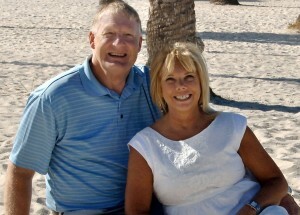 The Meekmas have faithfully served the festival for many years and through various roles. 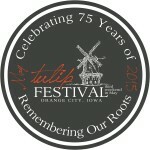 Terry served on the Tulip Festival Executive Committee and chaired the festival in 1997. He also oversaw the concessions for nearly a decade, organized street scrubbers, ushered in the reserved parade seating areas, auctioneered for the festival art prints, and drove floats. Terry is a current member of the singing bicycle group, the Fietsen Zangers. Rachel participated in the festival in her childhood through street scrubbing, float riding, and Dutch dancing. She served on the Queen’s Court and later was a member and chair of the Queen’s Committee.  Rachel was the chair of the festival in 2001, and followed that role by becoming the festival’s only paid employee, serving as the Tulip Festival’s part-time executive director for 13 years. Rachel retired from the position in January 2014 and continues to volunteer her time through organizational aspects of the event. Both individually and together, the Meekmas have demonstrated extraordinary dedication and passion for the annual Tulip Festival.